I noticed recently that I have so so so many Christmas stamp sets. Almost shameful. Really. I even have a few that have never even seen ink. GASP! To somewhat rectify this abysmal situation, I decided to set myself a little coming-up-on-Christmas challenge. I stacked all my Christmas sets into a pile on a table in my Creation Station. We must keep in mind, however, that these in the stack are only Stampin' Up! sets that are so "recent" as to be stored in the DVD-type cases. I still have a lot of the older sets too. I'll see if I end up getting to them. Each day, I close my eyes and slide out one set from the pile. Whichever is the set of the day I MUST make a card using at least one component from this set. 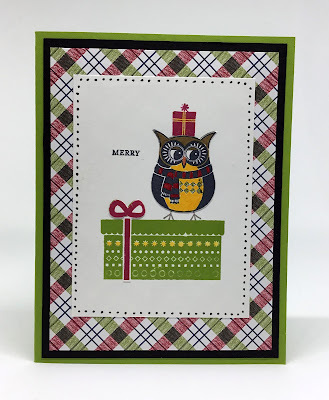 I've decided that for my Saturday blog posts from now until Christmas, I will show you the cards I'd made from this challenge. For each card, I will explain any details and/or techniques I've used on it. I present to you Day 1. This was actually NOT a random pick. I'd been holding in my hands an older stamp set that was more all occasion than Christmas. I noticed the cool window in the set, and aware that I'd never used that stamp before, I decided to concoct a wintry scene outside the window. I stamped the window from the older set, colored it with Stampin' Blends, fussy cut it, and popped it up against wallpaper-y Designer Series Paper. Outside the window, I built a snowy scene using stamps from a more recent set. The thing that doesn't show in my photo is that I used Wink of Stella on the snowman, the snow upon which he stands and the branches of the tree. I also colored these elements with Stampin' Blends. Day 2 you've already seen. Here comes Day 3. A simple card in looks, it features a cool technique that is so great to use with solid image stamps, such as these two Christmas ornaments: Ink up an ornament, then apply another clean stamp (I used the tall tree from Lovely As A Tree, page 148) directly to the inked portion, then twist it through the ink. Twist a few times in various places so the inked image then looks somewhat marbled. Stamp it onto cardstock. That's how I did both of these ornaments, although I must admit that the green one could have used a bit more twisting to produce more marbling. Remember, to do this technique, you need a solid image, then another DRY image with detail. I must admit that my Day 4 card proved to be more of a challenge and more time-consuming than I would have liked. A pretty basic, no nonsense card, the plan for it came together quickly. I knew I wanted to stamp the owl atop the large wrapped gift, and then to add the smaller gift from the set on top of his head. I originally stamped my owl in Gray Granite, then grabbed my Prismacolor Pencils to color him in. Unfortunately, Stampin' Up! Whisper White cardstock does not have enough of a tooth to work well with my colored pencils. I ended up with a less than satisfactory result. I tried going over it all with Stampin' Write Markers, but yuk. Finally I stamped him again on a scrap of Whisper White in Basic Gray. I then just colored him with Stampin' Write Markers. I used a little white gel pen to add catch lights in his eyes, fussy cut him, and adhered him over the first flop of an owl. To carry the fussy cutting a little further, I restamped the ribbon and bow, fussy cut them, and glued them over the previously stamped images. The little "Merry" seemed to fit in perfectly. After I mounted this piece of Whisper White against a Christmas-y DSP, it seemed too stark. Too sparse. So I got a Black Stampin' Write Marker and added dots around the perimeter of the white. This seemed to finish it nicely. Day 5 gives us a quietly elegant card. I will never stop loving this stamp set. The pine bough looks so real (as does the pinecone that accompanies it! ), but I am most enamored of the luscious ornament. The ornament I'd added directly to the pine bough image was embossed with a non-Stampin' Up! glittery gold embossing powder. For some reason, with that embossing powder, I lost most of the elegant detail, which would not do. To fix that situation, on a scrap of Whisper White, I stamped it again in VersaMark, but this time I embossed it with Stampin' Up! Gold Embossing Powder. After fussy cutting the ornament, I popped it up over the detail-less ornament I'd first stamped. I must admit that this card turned out to be a different size than I'd originally planned. I was trying to stamp a sentiment in the lower right corner. But -- HORROR! -- as I was approaching my stamping location, the stamp fell off the block and made a very unsightly inky smudge. Very disappointed with this unexpected development, I chopped off that portion of the cardstock, re-gathered my wits, and made it into an almost square card -- 4 1/2" x 5". I ultimately opted to resist putting any sentiment at all on the card. The white piece is mounted onto shiny Gold Foil Cardstock to echo the gold embossing and to further the feeling of elegance. My intention for my Day 6 card was to make it in nontraditional colors. I started out by choosing Lovely Lipstick and Bermuda Bay, but then ended up with a fairly traditional Granny Apple Green. A set that I'm not sure if I've ever used, doing these trees enabled me to utilize a punch that I'd had but rarely even touched. So, that's a good thing. The stars on the tops of the trees were punched out of some of the Gold Foil Cardstock that I'd used in the Day 5 card. I liked the happiness of the DSP I used in the background. Unfortunately, when I added my diecut sentiment, it got lost against the busy background. So, I cut another set of words with Bermuda Bay cardstock, shifted the white off a little from the underlying Bermuda Bay, popping it up off the background with Dimensionals, and I think it works. Through the use of strange colors and lots of Dimensionals, I think the card is fairly contemporary looking. Poor Rudolph, the star of Day 7! I love being able to use the coordinating punch to cut Rudolph out. I "mounted" him onto a brown oval that I'd run through the Big Shot inside the Woodgrain Embossing Folder to make it look like he was a mounted deer head. Not a very festive thought. But, he was a good sport about it all. For his sentiment, I dragged out the banner-like greeting from the set I used in Day 1. The Day 8 card is a little more special than it looks. I know you think I just embossed the star in gold onto a yellow-gold cardstock, right? Wrong. I embossed the star in gold onto Whisper White cardstock. After embossing, I used it as a resist by sponging on four other colors: So Saffron, Daffodil Delight, Crushed Curry, and finally a light coat of Pumpkin Pie. I'd intended to use this as a panel against the plaid DSP. But that was not at all to my liking. Thus, I dug out my old star dies and diecut the embossed star. It still didn't look right. So, I grabbed some Night of Navy cardstock and cut a larger star to which I mounted the golden star. That made the star portion a bit too large for a standard A2 sized card. I did not care. I went with it anyway. If I ever decided to mail it to someone, I will need to use a larger envelope or make a custom one to fit with my Envelope Punch Board. After cutting the star, I still had a lot of the sponged golden cardstock left over. So I decided to do my little greeting in gold embossing on this paper. I punched it out with an old oval punch I will never get rid of. I mounted it on a diecut piece of Night of Navy label from another retired die set. I wound gold cording three times around the plaid DSP before mounting it to my Night of Navy card base, then used Dimensionals to pop the sentiment up atop the cording. This morning I made my Day 9 card. It was so much fun to do and came together quite nicely. The stamp set I'd grabbed was one from last year (I think). It features two sizes of wonderful snowflakes (I can never have too many snowflake stamps!) and two wonky circle stamps. I stamped the wonky circles wonkily onto a 4" x 5 1/4" piece of Whisper White cardstock in Fresh Fig and Blackberry Bliss ink. Digging through my stash of retired cardstock scraps, I pulled out four different purples. I stamped and embossed the snowflakes in white onto these purples, punched them out with a 3/4" and a 1 3/4" punch. The larger snowflakes found places sort of centered inside the multiple lined circles, while the smaller snowflakes filled in the blank spaces. It was mounted onto a card base of Blackberry Bliss. I wanted my sentiment to be embossed as were all the snowflakes. But not in white -- at least, not onto white cardstock! Here is how you can make your embossing any color your little heart desires: Now pay close attention. This is VERY TRICKY. Not! I inked my sentiment stamp first in VersaMark ink, then I used Blackberry Bliss ink! Using the VersaMark ink first makes the image sticky enough for embossing powder to adhere to. Adding the desired color of ink makes it, well, the color you desire!! Very complicated, eh? After adding the sentiment, the card needed just a little bling to bring it to completion. I dug through old retired stuff, and came upon this beautiful metal piece. Looks kinda like a snowflake, doesn't it? Until my next installment next Saturday. Stay well. I always enjoy your cards in the best Friday Features- I stamp also and really enjoy it. My SU demo told me that the new cling stamps will REALLY cling, unlike the current ones, so we shouldn't have any more smudge problem like you did with one of your posted cards.Let's hope that problem will be solved! Thanks! I'm glad you enjoy my cards. I cannot wait for the cling-y stamps. Can't come soon enough!